When Betty accuses gentle loner Toby - a traumatised ex-soldier - of a terrible act, Annabelle knows he's innocent. Then Betty d Annabelle has lived in Wolf Hollow all her life: a quiet place, still scarred by two world wars. But when cruel, manipulative Betty arrives in town, Annabelle's calm world is shattered, along with everything she's ever known about right and wrong. To ask other readers questions about Wolf Hollow, please sign up. Don't you think that you have Wolf Hollow mis-classified? This is not a children's book, but rather a young adult book. I am new to Goodreads. How is it possible for people to rate a book that is not yet published, as is the case here? Onalee Smith Many people in the Publishing industry receive early manuscripts or ARCs before the hardcover or paperback edition is officially for sale. Annabelle did more than that. She is so real and true, and maybe a little naïve, but I couldn’t help but see myself in her. I guess Annabelle is one of the most realistic, relatable middle grade heroines I have met in a very long time. 3.5 stars I liked most of this book very much. Set during World War II, it's the story of Annabelle, whose idyllic farm life and friendship with an older war veteran named Toby is threatened when a bully (view spoiler)[and really, sadist (hide spoiler)] named Betty moves into town. Things I enjoyed: the rural Pennsylvania setting, Annabelle's family (particularly her parents), the friendship with Toby, and the explanation behind the title Wolf Hollow, which is also the name of the town. My favor 3.5 stars I liked most of this book very much. Set during World War II, it's the story of Annabelle, whose idyllic farm life and friendship with an older war veteran named Toby is threatened when a bully (view spoiler)[and really, sadist (hide spoiler)] named Betty moves into town. Things I enjoyed: the rural Pennsylvania setting, Annabelle's family (particularly her parents), the friendship with Toby, and the explanation behind the title Wolf Hollow, which is also the name of the town. My favorite thing about the book was the way it makes you feel deeply for veterans of war, especially the way trauma can change someone and how little sympathy and patience we sometimes extend to those we don't understand. Even as I experienced sadness and pity, however, I couldn't help being conscious of being maneuvered into feeling that way; it's not overly written, exactly, but perhaps some of the "teaching" moments were emphasized a touch too much or a touch too often for me to dissolve into the kind of grief or tears that I think a story like this would normally elicit. Betty the young villainness is also so cruel, and the scenarios so involved (view spoiler)[REAL spoilers, so don't read if you don't want to know (view spoiler)[she starts out as a regular bully, but then wrings a bird's neck and uses a wire to hurt Annabelle's brother, then she lies about seeing Toby doing something terrible, and THEN she falls into a well and publicly blames him for it and THEN she dies because of gangrene (hide spoiler)] (hide spoiler)] that I sometimes had a hard time suspending disbelief. It's not that children can't be cruel, but within the context of this story and our limited understanding of Betty, I didn't feel entirely satisfied with her portrayal or her role in the way things play out. On a more positive note: I don't know the exact inspiration behind this book, but I definitely felt shades of To Kill a Mockingbird as I was reading it, and seeing the blurb afterwards confirms that those echoes aren't unfounded. The parallels are strongest for the unjust accusations and mob mentality (view spoiler)[though in true modern form, our heroine is allowed to take more action (hide spoiler)], the mockingbird/wolf analogy, and the feel of a childhood disturbed. Whether this was meant to be a reimagining of TKAM, or just strongly influenced by it, the author really does pull off the difficult trick of giving us a Boo Radley figure, as well as tracing the way a friendship with an adult can be an important basis for our formation. As a child, I had strong relationships with adults that help make me who I am, and I'm glad to see that books like this and Tell the Wolves I'm Home explore that. We see so many stories, real and imagined, about the dangers adults can present to kids that it's nice to enjoy a positive experience as well. Worthwhile reading? Most definitely. I was moved by it and appreciated what it set out to do. I just wish it had pulled back just a little, and that Betty was better realized, and that some of what happens didn't feel quite so inevitable. I might've even cried if the story didn't work quite so hard to make me do so. An audio review copy was provided by the publisher. Emily Rankin does a lovely job narrating the story, by the way. Perhaps a few too many meaningful pauses, but her overall reading (and the different voices) were very enjoyable to listen to. This review has been hidden because it contains spoilers. To view it, click here. I am not what you might call a very brave reader. This is probably why I primarily consume children’s literature. I might puff myself up with a defense that lists the many fine aspects of this particular type of writing and believe it too, but sometimes when you catch me in a weak moment I might confess that another reason I like reading books for kids is that the content is so very “safe” in comparison to books for adults. Disturbing elements are kept at a minimum. There’s always a undercurrent I am not what you might call a very brave reader. This is probably why I primarily consume children’s literature. I might puff myself up with a defense that lists the many fine aspects of this particular type of writing and believe it too, but sometimes when you catch me in a weak moment I might confess that another reason I like reading books for kids is that the content is so very “safe” in comparison to books for adults. Disturbing elements are kept at a minimum. There’s always a undercurrent of hope running through the book, promising that maybe we don’t live in a cold, cruel, calculating universe that cares for us not one jot. Even so, that doesn’t mean that I don’t sometimes have difficulty with books written for, oh say, 10-year-olds. I do. I’m not proud of it, but I do. So when I flipped to the back of Wolf Hollow mid-way through reading it, I want to tell you that I did so not because I wanted to spoil the ending for myself but because I honestly couldn’t turn another page until I knew precisely how everything was going to fall out. In her debut children’s book, Lauren Wolk dives head first into difficult material. A compelling author, the book is making the assumption that child readers will want to see what happens to its characters, even when the foreshadowing is so thick you’d need a knife to cut through it. Even when the ending may not be the happy one everyone expects. And you know what? The book might be right. It is fair to say that if Betty Glengarry hadn’t moved to western Pennsylvania in the autumn of 1943 then Annabelle would not have needed to become a liar later. Betty looks the part of the blond, blue-eyed innocent, but that exterior hides a nasty spirit. Within days of her arrival she’s threatened Annabelle and said in no uncertain terms that unless she’s brought something special she’ll take it out on the girl’s little brothers. Annabelle is saved from Betty's threats by Toby, a war veteran with issues of his own. That’s when Betty begins a more concentrated campaign of pain. Rocks are thrown. Accusations made. There’s an incident that comes close to beheading someone. And then, when things look particularly bad, Betty disappears. And so does Toby. Now Annabelle finds herself trying to figure out what is right, what is wrong, and whether lies can ever lead people to the truth. "A wolf is not a dog and never will be," he said, "no matter how you raise it." There is a girl, a bully, a family and a loner. There is fear, and strength, false accusations, and true affection. Above all, there is grace in the presence of utter cruelty. Loved it!! A story about bullies and being a decent human being. I'd recommend to YAs and adults alike. Wolk weaved a wonderful story from beginning to end... This was her debut and I must say a very good one. I recently read Beyond the Bright Sea and it doesn't compare to this.. I almost want to start a whole new shelf just for this "middle-grade-except-not-really". Yes, it is yet another much hyped and lauded MG book of 2016 I don't like. It will be easy for many to dismiss me as simply having a contrary year, but really why the love for this book in the kidlit world? It is extremely well written. It is not a book for children though. I'm not saying this in a way that means "teacher book" like I would call Pax or that it's like a Pixar movie in book form like I would ca I almost want to start a whole new shelf just for this "middle-grade-except-not-really". I really loved this book. It's gorgeously written, full of wisdom, and hard to put down. The thing is, I'm not entirely convinced it's a children's book. Someone told me the author originally imagined it being marketed to adults but she was persuaded to turn it into a middle grade novel. Even if that's not true, it seems true. Like The Catcher in the Rye and To Kill a Mockingbird, this book is complex enough for any adult, but happens to follow the experiences of a young person. Does that in its I really loved this book. It's gorgeously written, full of wisdom, and hard to put down. The thing is, I'm not entirely convinced it's a children's book. Someone told me the author originally imagined it being marketed to adults but she was persuaded to turn it into a middle grade novel. Even if that's not true, it seems true. Like The Catcher in the Rye and To Kill a Mockingbird, this book is complex enough for any adult, but happens to follow the experiences of a young person. Does that in itself make it a YA or middle grade book? As I was reading I noted many places where the meaning was so subtle, I had to re-read it and then put the book down for a minute to ponder. It was also so heart-wrenching at times, so real, that tears sprang to my eyes. I'm not saying this book is "inappropriate" for children. I'm saying most children are probably not mature enough to really sink their teeth into it. The voice of the narration is that of an older Annabelle looking back on the year before she turned 12. It's not fully an 11-year-old's voice, though the narration accounts for what she perceived at the time, versus what she understands in retrospect. I know one should never judge a book by it's cover, yet I saw the title and the cover and I knew I wanted to read this. I had no idea what it would be about. I thought it might be a fantasy story. It was so much more than I expected and so deep. This is set in the 40s during the war. Annabeth lives in a small farm town in Pennsylvania where life is idyllic. Then a girl her age moves in named Betty. Betty is one of those people that only want to see the world burn. She is a leaf from the page of I know one should never judge a book by it's cover, yet I saw the title and the cover and I knew I wanted to read this. I had no idea what it would be about. I thought it might be a fantasy story. It was so much more than I expected and so deep. This is set in the 40s during the war. Annabeth lives in a small farm town in Pennsylvania where life is idyllic. Then a girl her age moves in named Betty. Betty is one of those people that only want to see the world burn. She is a leaf from the page of a bad seed. Even at the end of the story, she does not change or bend. As soon as Betty shows up, things start happening and Annabeth is bullied. People are hurt. Annabeth does her best to tell her parents what is happening. She thinks things will get better and yet they only get worse. One of the main characters is a homeless man named Toby who was in WWI. He is broken and suffering from PTSD. Many people think he is very weird, but Annabeth and her family treat Toby with respect and Annabeth is friends with Toby. The story is about Annabeth struggling with the truth. Betty tells lies and people believe her and Annabeth knows she is lying, yet no one believes that. This is a coming of age story about dealing with the truth and very big issues. It is also about decisions we make and how we must live with those decisions. It is a deep book with much heart and having integrity. Wolf Hollow is the kind of book where, with about 20 pages left to read, you start hoping there's a sequel because you don't want it to end. Extremely well-written, not a single unnecessary word, no fat to trim. Suspenseful, intriguing and compelling all the way through. A very good read! A beautifully simple yet emotionally intense and deep, well-written story! Set in 1943, this is the story of 11-year-old Annabelle. A nice book to read. Indeed, a goodread! Great young adult book about bullies and knowing who you are. A hard look at the way we treat others: strangers, friends, and family, set against the backdrop of a small farm community during WWII. A tragic book, not maudlin or unnecessarily grim, but definitely not a cheerful story. I have heard nothing but praise for it, even before the Newbery Honor, and I hope it continues to hold people's attention, because it should be widely read. [No spoilers] This is not a happy book. What did I like most about it? It tackled some really heavy topics, such as death, depression and mental illness, and bullying. And the cover - that cover is gorgeous. 1) It didn't feel like it was set in the 1940s. The setting felt older than that to me. 2) Those heavy topics weren't really fleshed out enough for my liking or well enough to explain to kids. I can't imagine reading this as a child and understanding what Toby' [No spoilers] This is not a happy book. What did I like most about it? It tackled some really heavy topics, such as death, depression and mental illness, and bullying. And the cover - that cover is gorgeous. 2) Those heavy topics weren't really fleshed out enough for my liking or well enough to explain to kids. I can't imagine reading this as a child and understanding what Toby's condition was, for instance. Maybe the reader isn't meant to understand? 3) I didn't think the parental figures were very realistic when it came to including Annabelle in such adult conversations. Maybe they saw her as older than her years, and she did seem quite mature for a 12-year-old. 4) There seemed to be too much of a formula. Step 1: Annabelle sees a problem. Step 2: Annabelle doesn't know what to do. Step 3: Annabelle ponders and comes up with an answer. Step 4: Annabelle lies to her parents and digs herself deeper. Step 5: The truth comes out and Annabelle saves the day, with no retribution for her lies or more dangerous actions. 5) The more graphic moments felt, to me, to be thrown into the story in order to bring it up a level. It didn't feel well-executed IMO. 5) Henry's turnaround. What was that about? It wasn't explained at all, really. Just like BAM he grew up out of nowhere? A beautifully raw novel for all ages. One of those stories that whisks you away to another time and place, and makes you feel love, hate, and a rainbow of emotions in between. Splendid! Well! I was surprised by this book. Picked up this book because a lot of other people i knew were reading it and someone recommended it(well a few). At first i was thinking that it was going to be a soft book with a reasonable dilemma but toned down from its reality. This book was NOT THAT. This book "stars" a young girl named Annabelle. She lives on a rural farm in a town in WWII era Pennsylvania. She meets Betty, a wonderful little girl, who is nothing but a BULLY. I couldn't figure out from the book why Betty was such an evil person, but i don't think that is what the author was focused on that in the story. Betty bullies the crap out of Annabelle, as in she does some really nasty things to her. Another part of the story is Toby. A WWI vet., a "wanderer" according to the book. He is a very big introvert, he speaks to almost no one, and barely says anything when he does. Supposedly, Toby is not PTSD or ShellShock, he just has something else inside of him from the war. This elaborates in the story, but i'll leave it there. Eventually Toby and Betty's paths meet and a battle of trust, anger, and sympathy ensue. I liked how this book played out but i feel like the author wasn't quite sure how it would play out. If we could have gotten multiple points of view in this story it could have been better an saved me from some anguish through the book, but i'll let it go. I think we might have gotten a slightly more complete/filled-out story if the author had done this. STILL A GREAT BOOK, No regrets about reading this book although i don't know if i really learned any lessons. I am extremely disappointed. For a lot of reasons. I'm disappointed that this kind of book is put in the children's section at the library. I'm disappointed that the story was so dark and disturbing. I'm even disappointed that the story didn't live up to the pretty cover. This is NOT a book I would EVER recommend to children. Ever, ever, ever. It makes me cringe to think of my little sister reading this - I would never give this to her. It was hard for me to read as a sixteen-year-old. The writin I am extremely disappointed. For a lot of reasons. e wrong. The plot was full of holes, and there is a lot of lying, deceit, and concealing things from parents. Annabelle is unbelievable. I don't think any eleven/twelve-year-olds actually act like her. I was not sucked in by the characters, and wasn't gripped by the story, and only kept reading because I wanted to know if it really continued to be as bad as it was already. I was never extremely sad because I didn't connect with the characters, but everything was very sad and depressing. It was graphic, disturbing, and ending in a grim way with hardly any hope. I believe that no matter how dark the story, there should always be a glimmer of hope running through, especially in children's stories. I don't understand why this is in the children's section. I have been very disappointed by middle grade fiction, which is one of the reasons I'm determined to write REALLY GOOD middle grade. Because this is not what children should be reading. This is not a story for children. When I look at the books in the children's section of the library, I am disappointed because these books are the ones forming the minds of the next generation, and a good deal of them are rubbish. This book is gripping and masterfully written. It distresses and surprises. It will break your heart while expanding it. "At times, I was so confused that I felt like the stem of a pinwheel surrounded by whir and clatter, but through that whole unsettling time I knew that it simply would not do to hide in the barn with a book and an apple and let events plunge forward without me..."
These were fitting lines of a first chapter to read in November of 2016. 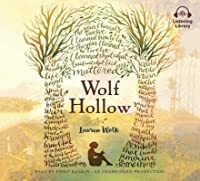 I will not rate Lauren Wolk's Wolf Hollow, since I'm well outside its target market, but it tells a deep, profound story I am sure many intelligent middle school readers will benefit much from. The style is stark and easy to read, reminding me of Hemingway. It's set in Appalachian Pennsylvania in the 1940's, and includes elements that contemporary readers may find shocking. For instance, there were both cars and horses in use. And, despite FDR's push for rural electrification, having electricity I will not rate Lauren Wolk's Wolf Hollow, since I'm well outside its target market, but it tells a deep, profound story I am sure many intelligent middle school readers will benefit much from. The style is stark and easy to read, reminding me of Hemingway. It's set in Appalachian Pennsylvania in the 1940's, and includes elements that contemporary readers may find shocking. For instance, there were both cars and horses in use. And, despite FDR's push for rural electrification, having electricity was still novel, and for the middle classes. The plot is reminiscent of Harper Lee's classic To Kill a Mockingbird, where an oddball loner (the role of Lee’s Boo Radley taken by Wolk’s homeless WWI vet Toby Jordan) helps a decent, kind hearted and moral young girl coming of age (the role of Scout filled by the likeable Annabelle). What's more, in both Mockingbird and Wolf, a community blames a wrongdoing on an innocent victim. To Kill a Mockingbird, on the other hand, is a serious meditation on both racism, societal norms and personal moral responsibility. Lee's antagonists are drawn with skill. And while their racism isn't justified, the society they grow up in makes it understandable. For the 1950's south, the novel's setting, employs openly racist, Jim Crow rules that make white supremacist ideas concrete. There are different drinking fountains for blacks, different (and often more expensive) stores for blacks, and inferior schools for blacks. All this carries the message that blacks are inferior. This complex social/ societal understanding of morality, present in the great rural southern and Appalachian writers like Faulkner and Lee, is missing in Wolk. Which makes it less suited to the adult reader. Perhaps its readership also explains Wolf Hollow's great weakness, its antagonist, Betty. She seems thinly drawn. And while bullying is real, she seems more plot element than a realized character. Still, since this is a middle grades book, where many see reality in morally unambiguous black and white. the younger readers would struggle with the morality of Annabelle lying for a good cause. Further, Wolk does a fabulous job illustrating what Annabelle learns about the consequences of her actions, even when done for good reasons: sometimes she succeeds despite having lied, and sometimes she fails despite being just. So adding an ambiguous antagonist would tax these younger readers, blunting the morality Wolk explores. 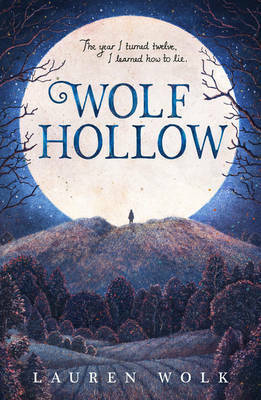 So while Mockingbird is the superior book written for adults despite Lee's young protagonist, Wolf Hollow is a well crafted, literary tale that a serious youngster would read and love. I have a favorite bookstore at the beach. They are always well stocked and have a staff that is extremely well read. In fact, one of my favorite aspects of this shop is their "Staff Recommendations" sections in the front of the store. I had gone into the shop this spring looking for a new YA book that I had on my list and one of the sales clerks overheard me asking at the front desk, ran to the back of the store and came back with this book. She was a very quiet, shy young girl and yet her enthu I have a favorite bookstore at the beach. They are always well stocked and have a staff that is extremely well read. In fact, one of my favorite aspects of this shop is their "Staff Recommendations" sections in the front of the store. I had gone into the shop this spring looking for a new YA book that I had on my list and one of the sales clerks overheard me asking at the front desk, ran to the back of the store and came back with this book. She was a very quiet, shy young girl and yet her enthusiasm for "Wolf Hollow" was contagious. She had just finished this book and loved it. I began reading it, but was sidetracked by new releases at the library and reading group selections. When I picked it up again two days ago, I couldn't put it down. This is the story of 12 year old Annabelle who lives in the rural Pennsylvania countryside following WWII. The farming community there all knows one another, they have suffered losses in the war and some residual prejudice remains against people of German descent. Annabelle is the oldest of 3 children with 2 younger, rambunctious brothers. Their quiet, ordinary life is suddenly disrupted when a new student arrives and begins to bully Annabelle and her brothers. AMAZING book! I am definitely not the first to call it, but will echo many of the voices I have heard, which have said this is a Newbery contender. The story and the character development was so well done. You instantly fall in love, out of favor, and are so unsure what to make of characters in this novel. By the end, it all becomes clear to you, but not all emotion will be resolved for you (at least it hasn't yet for me). The story itself is so original and will have you literally devouring your AMAZING book! I am definitely not the first to call it, but will echo many of the voices I have heard, which have said this is a Newbery contender. The story and the character development was so well done. You instantly fall in love, out of favor, and are so unsure what to make of characters in this novel. By the end, it all becomes clear to you, but not all emotion will be resolved for you (at least it hasn't yet for me). The story itself is so original and will have you literally devouring your fingernails! This historical fiction novel reminded me in some ways of current books like The War that Saved my Life, Some Kind of Courage, and Hour of the Bees. 4.5 stars. This one was a nice surprise. I wasn't exactly sure what to expect, because I never read the description, I just liked the cover. As it turns out, I enjoyed it very much. Probably even more so, because I went in clueless. I just read the description now, and I doubt I would've enjoyed the story as much, had I known all the spoily bit in it. There's something nostalgic about it, and it's so well-told. It's cruel too, and kinda gorgeous. I loved the setting, and the appalling villain ma 4.5 stars. This one was a nice surprise. I wasn't exactly sure what to expect, because I never read the description, I just liked the cover. As it turns out, I enjoyed it very much. Probably even more so, because I went in clueless. I just read the description now, and I doubt I would've enjoyed the story as much, had I known all the spoily bit in it. There's something nostalgic about it, and it's so well-told. It's cruel too, and kinda gorgeous. I loved the setting, and the appalling villain made me very invested in how the story would unfold. This book made me very angry. Then it made me so, so sad. I cried. It is one of the best books I have ever read. 5 stars aren't enough. Profound. I still don't know how a brand new book can feel like such a classic story. I have only one description for this book: To Kill a Mockingbird & Of Mice and Men meet Children's Literature. Annabelle lives in a small, rural town in Pennsylvania in 1943. Her school is crowded, but she shares a desk with her friend Ruth, who is quiet and pleasant, much like Annabelle's life. When Betty Glengarry moves to town to be raised by her grandparents, that changes. Betty waits for Annabelle on her walk home, and demands money or things, and hits Annabelle when she stands up to her and refuses to give her anything. Betty also threatens Annabelle's younger brothers, and carried through with the threatened beatings. Annabelle capitulates, but even that doesn't really help. At one point, Betty hits Ruth with a rock, and the blame for Ruth losing an eye is placed on Toby, a WWI vet who lives in an abandoned smoke house and is considered harmless but potentially dangerous by the community. When Betty goes missing, Toby is again blamed, and Annabelle gets involved both in the search for the missing girl and in protecting Toby from people who mean him harm. Strengths: This will probably win the Newbery this year. It is lyrical, has that sad, nostalgic vibe going, and feels a little bit like To Kill a Mockingbird. Weaknesses: This is very slow paced, and uses language that adults love but younger readers (and I) find to be pointless and boring. (E.G. "At times, I was so confused that I felt like the stem of a pinwheel surrounded by whir and clatter...") That's on the very first page, where it is crucial to have "something happen" and hook middle grade readers. There is also a very disturbing scene where Betty kills a bird. While there wasn't anything inappropriate, the topics discussed require a certain maturity to understand. Set in the countryside of Pennsylvania during the second world war, Annabelle's life is turned upside down when Betty comes to town. Betty is a bully of the worst kind: everyone believes her and can't see past the façade. Annabelle is friends with enigmatic Toby - he is former soldier that is suffering from what can only be PTSD. Toby lives on the periphery of the town and so is automatically an outcast, but Annabelle's family always shows him kindness. The story goes in a direction that has the Set in the countryside of Pennsylvania during the second world war, Annabelle's life is turned upside down when Betty comes to town. Betty is a bully of the worst kind: everyone believes her and can't see past the façade. The story goes in a direction that has the reader on edge and I literally burst into tears when I got to a page at the end. Burst into tears. This book was fantastic start to finish. The writing, the story, interesting, sympathetic or repugnant characters, good storytelling. Loved it. (The cover is beautiful too.) Read the 1-page prologue and you will be hooked! Top of my Newbery list at the moment.